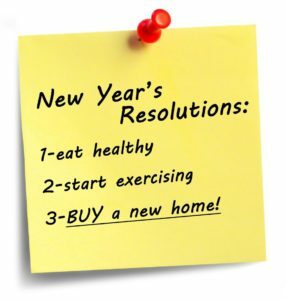 If buying a home will be one of your New Year Resolutions, here are some tips that can help you achieve that resolution. There are too many myths and issues floating around that can discourage potential home buyers’ – especially first-time home buyers. Let’s take a look at a few of these. Tip #1 You do notneed to have 20% down payment in order to get a mortgage. Although banks like to see home buyers have “some skin in the game” like 20% down, you can buy a house with as little as 3.0% down with some programs and with a Veteran’s VA loan or a USDA loan you can buy a house with zero down payment in many circumstances! Tip #2 Do not wait until it is too late to make your move in buying a house. Generally speaking, it will take 30-60 days from the time you have a ratified contract on a property to get to the closing table. All too often, I have clients who are renting, and they decide to buy a house and they have to move or renew their rent in 30 days or less. It’s not going to happen, and they wind up renewing their lease again. Plan ahead! If you are not sure about your credit score or if you know its low, my suggestion is to talk to a REALTOR® 6-12 months before you are looking to buy. That way, if there are issues on your credit history you have some time to try to resolve the issues. TIP #3 Who comes first, the chicken or the egg. If you talk to a mortgage officer, they will undoubtedly tell you that the first person you should talk to is a mortgage officer. If you talk to a REALTOR®, they will undoubtedly tell you to talk to a REALTOR® first. Here is the truth – it really doesn’t matter who you talk to first – as long as you are making headway in buying a home. My suggestion – as a REALTOR® – is to talk to the REALTOR® first and here is why. The REALTOR® is going to work with you from start to finish. If you talk to a mortgage person from, let’s say ABC Bank, they will provide you with mortgage options that the bank sponsors. These options may not work for you. If that is the only options the bank offers, you may walk away believing that you cannot get a mortgage. A REALTOR® will work with mortgage brokers who have access to a wide range of mortgage options and may be more likely to be able to find a mortgage that works for you. Tip #4 The old dilemma is whether you should pay down debt or save money to buy a house. This is a perfect example where it pays to talk to a REALTOR® who can get you in touch with a mortgage person who can work with your specific needs. Whether you pay down debt or save money is going to depend in large part about your specific situation. I recently had a client who talked to a mortgage officer prior to calling me. He was pre-approved and we began looking at houses. When the couple found a house they liked, the closing costs for this house was so high it put them out of the market. I referred them to a mortgage officer I have worked with many times and he was able to find them a mortgage with significantly less closing costs and they were able to close on the property. It pays to shop around. Tip #5 This tip is very important! When you are looking for a house to buy, be sure you are looking on a reputable website. Many of the popular websites are what we call secondary websites. For example: When a property is listed with an agent it is put in the MLS (Multiple Listing Service). These listings go out to all the brokers such as Coldwell Banker almost instantly. Other websites, are not actually real estate websites – their business model is advertising. They pull data, such as listings, from the MLS and place it on their website with the hopes that you look at their site to find a home. The problem is that their business model is not very interested in updating their website once the home has a contract, sold or just taken off the market. I get calls all the time where someone found a home they like, and it was sold a year ago. If you are working with a Coldwell Banker REALTOR®, they have a link that you can access the MLS through their website to ensure you are getting the most accurate information. Or, you can search the MLS through www.realtor.com. If I can help with any of your real estate needs, please feel free to text or call me at 301-712-8808 or email me at RolandLow1@gmail.com.